The 11th century Nea Moni (New Monastery) on the eastern Aegean island of Chios represents a characteristic example of the Middle Byzantine architecture and aesthetics, a period known as the golden age of Byzantine art or the Rennaisance of the Macedonian dynasty reign. The main church of the complex, the katholikon is built on a cross-in-square plan with a large dome supported by squinches defining an octagonal space. The dome, approximately 7 m in diameter, has no lateral bays but is placed between a triconch sanctuary and a narthex preceded by an exonarthex with lateral absides. The construction of Nea Moni illustrates the so-called insular architectural type, found in Chios and Cyprus. The interior is decorated with superb mosaics on a gold background, among the finest examples of the Byzantine era, a folk transcription of the great models of Constantinople. 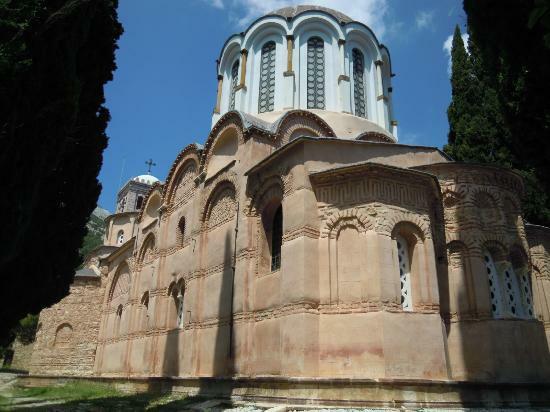 The construction of the monastery is fully documented as it was linked to a major event in Byzantine history. Constantine the Gladiator, a nobleman living in exile, was told by two monks of Chios, Nicetas and John, that he would become Emperor. When Constantine Monomachos married the twice-widowed 64-year-old Empress Zoe in 1042, thus becoming Basileus, he remembered the prediction. In 1045 he founded the monastery, choosing as its site a valley on Chios on the slopes of Mount Aetos and bestowing it with possessions and privileges. At its peak, around 1300, Nea Moni was one of the wealthiest monasteries in the Aegean. History sealed its fate once more in the 1822 Chios massacre by Ottoman troops during the Greek War of Independence. Nea Moni, sacked and looted, never regained its former glory.